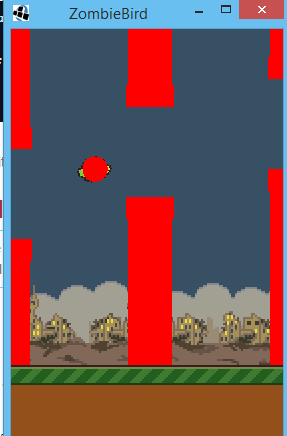 Welcome back to your libGDX Flappy Bird tutorial! Today, we are going to add collision detection so that our game knows when our bird dies. In Flappy Bird, death occurs in one of two ways. You either make contact with the ground or you hit one of the pipes. We will be implementing the latter type of death in this tutorial (collision with a pipe), and we will be playing a sound effect when this happens! Let's get started. I'm picking up from where we left off in Day 7 of this series. If you want to follow along, feel free to download the source code on that page and come back. If you've been using my source code, we need to fix a small mistake. I accidentally copied the same if statement two times, so we must remove one. I originally thought about using a rotating polygon to handle collision, but after experimenting, I discovered that a circle is much easier to implement and equally as effective. So, we are going to go with the simpler solution. The idea is that the circle will always be at centered at the same point. It does not need to rotate. This collision circle will always cover the bird's head. Because of the way the bird moves, the rear of the bird is extremely unlikely to make contact with the pipes, so we will not prioritize checking that area. The Pipe object, in our game, comprises both the upper and lower pipes. Each of these pipes will be treated using two rectangles. One rectangle will cover the skull, the other rectangle will cover the base. When checking for collision, we simply have to use the built-in Intersector class, which as a method for checking collision between rectangles and circles. Once this collision is detected, we will inform the our game that this happened, and we will tell all of our scrolling objects to stop. We will begin by quickly creating the bounding Circle for our Bird. Open up the Bird class. - Create an instance variable of Circle (import com.badlogic.gdx.math.Circle;) called boundingCircle. We must set the circle's coordinates each time that the Bird moves. The Bird moves when we add the scaled velocity to the position, so add the following in bold directly below this line -> position.add(velocity.cpy().scl(delta)). - Add a getter method for the boundingCircle. Next, we are going to make sure that our Circle is positioned correctly. Open up the GameRenderer and add these four lines of code at the very bottom of the render method. We are going to draw the boundingCircle. Now that we have the Bird's bounding circle, we must create the four Rectangle objects to represent each of our Pipe objects as shown below. Open the Pipe class. There's going to be a lot of seemingly arbitrary pixel width and height values in this section, so please refer to the diagram below. Also read the comments that I have made in my code carefully, so that you can follow my logic. We are going to implement the above diagram in our code. - Create the following instance variables (import com.badlogic.gdx.math.Rectangle). As with the Bird's boundingCircle, we must update each of the four rectangles whenever our Pipe object's position is updated. At the moment, our Pipe does not have an update method. It is inheriting the update method from the Scrollable class. We could try to update our four rectangles in our Scrollable class, but the easier way to do this is to @Override the update method (review what this means in Day 7 if you have forgotten). By calling super, we are calling the original update method that belongs to the Scrollable class. Any code that follows the super call is additional functionality. In this case, we simply update our four rectangles. // with respect to its bar). Now let's go back to the GameRenderer and add some lines of code at the end of the Render method. This is just temporary code for testing. Just copy and paste as shown below. We have the necessary bounding boxes to test for collision. Now we simply have to add the logic. Checking for collision requires multiple classes working together. - The ScrollHandler has access to all the Pipes and their bounding rectangles, so it should be the one doing the actual collision checking. 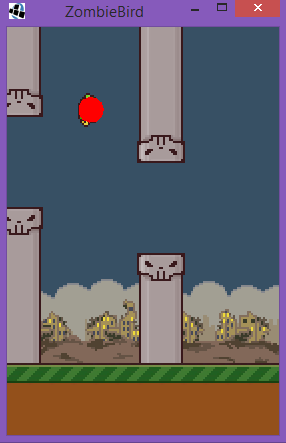 - The GameWorld needs to know when the collision occurs, so that it can handle the collision (get current score, make the bird stop, play sound, etc). 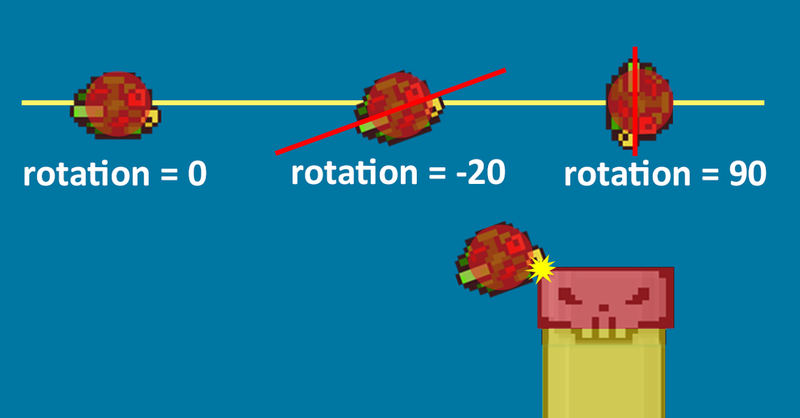 - The GameRenderer, once the Bird dies, needs to be able to react (show the score, display a flash). We will start in the GameWorld class. We will add the following in bold to our update method. // Return true if ANY pipe hits the bird. Now, to fix errors, we need to make two changes. Our Scrollable objects (Pipe and Grass) need to be able to stop, so we will create a stop method inside the Scrollable Class. In this method, we begin by checking if the position.x is less than bird.getX + bird.getWidth, because otherwise, collision is impossible. This is a very cheap check (it does not take much toll on performance). Most of the time, this condition will fail, and we will not have to perform the more expensive checks. If this if statement does evalute to true, we do the much more expensive Intersector.overlaps() calls (which returns true if the circle argument object collides with a rectangle argument object). We will return true if any of the four rectangle collides with the bird's circle. Now that we have completed all the collision checking code, run your game to make sure that it's working! 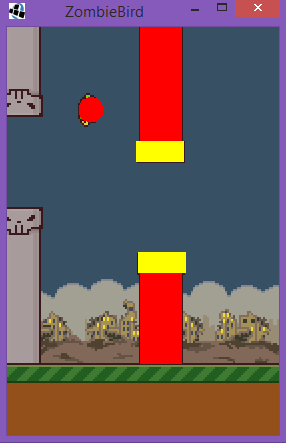 One the Bird collides with one of the pipes, all the scrolling should stop. We will do some more sophisticated death handling in Day 9. For now, let's try playing a sound file when the bird dies. Here's a sound file that I created using bfxr. 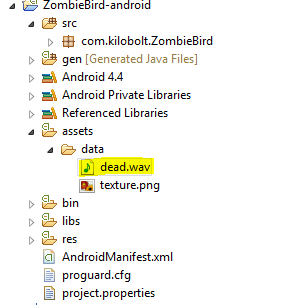 Download this file into your ZombieBird-android project's assets/data folder. Make sure that you COPY it in there, do NOT create a LINK. Now that we have a sound file, we must create a Sound object using this file in our AssetLoader. Sound objects are stored in memory and can be loaded once and used quickly (this is appropriate for short sound files, which have a very small file size). Now, when your Bird dies, it will play a sound file (just once)! Here's the updated GameWorld. Try running the game! Our game is almost fully implemented. In Day 9, we will finish up the rest of the gameplay and start adding some UI. Let's finish strong!